Larry Edelson writes: Gold's precipitous tumble from its record-high of $1,038 set on March 17 down to the recent $850 level has lots of people asking, "Is gold's bull market over?" My answer: No! Not by a long shot! I know you've been getting an earful from the talking-head ninnies about how the long-running commodity bull is getting short of breath and is about to be put out to pasture. Ignore them. Other than a pullback here and there, gold — and virtually all natural resource prices — are headed much higher in the months and years ahead. My next target for gold: $1,250 an ounce. Then, its inflation-adjusted high of at least $2,270. Those numbers should come as no surprise. I've mentioned them several times before. Why I am I so bullish? I'm not going to get into all the arguments that clearly spell higher prices for gold. You've heard them from me time-and-time again. Gold Is In A "Win-Win" Situation! Scenario #1: Fed's Efforts to Save the U.S. Economy and Financial System Succeed ... Credit Crisis Eases. Under this scenario, the Fed's recent actions of slashing interest rates and pumping money into the economy are successful — the U.S. economy recovers and global growth resumes. As a result, the credit crunch eases, and money flows through the pipeline. The big commercial and investment banks finally stop taking massive write-downs on bad mortgage securities. Foreclosures shrink, home prices stop hemorrhaging, and home sales pick up. Businesses start hiring and consumers resume spending. Life is good again. In this scenario, many talking heads on Wall Street say that gold's bull market would be over. They'd point out that there would be no reason for investors to flock to the safety of gold. The Fed is GOOD for Gold! If the Fed is successful at turning the U.S. economy and credit crisis around, it will only be because it flooded the system with hundreds of billions of paper dollars, creating wild inflation. If the economy were to pick up on top of that, between inflation and resumed economic growth, global demand for gold would soar. Of course, the media mavens would then argue that when the economy turns back up, the Fed will jump in with both feet to head off inflation by aggressively raising interest rates, choking off the bull market in gold. That's also hogwash. In fact, look at the recent record. From late 2004 to mid-2006, the Fed raised interest rates 17 times, in steady quarter-point increments to 5.25% from a low of 1%. And over that period, gold surged 127%! Look at it this way: Even with the U.S. economy in a bad funk — gold demand hit a record $79 billion in 2007. Most of the increased demand — no surprise here — came from Asia and the Middle East. Demand from No. 1 gold customer India rose 7%. China is home to the second-largest jewelry market in the world today. 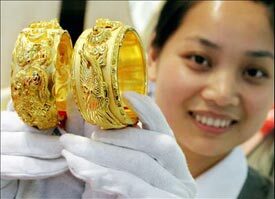 China's gold demand jumped 26%, catapulting it to the second-largest gold jewelry market in the world ... and knocking the U.S. out of the No. 2 slot. Other Asian and Middle East countries are seeing rising gold demand as well: Hong Kong — up 15% ... Saudi Arabia — up 15% ... Egypt — up 12% ... UAE — up 7% (a new annual record) ... Russia — up 11% (a new annual record). So if the Fed's actions work ... the U.S. economy rebounds riding a new wave of inflation ... the mortgage crisis subsides: Demand for gold will fly off the charts, sending the yellow metal's price skyward. Now let's take a look at the flip side. Scenario #2: Fed Rescue Efforts Fail ... Credit Crisis Worsens ... Recession Deepens. Bearish for gold? No way, Jose! The Fed will just keep pumping trillions more dollars into the economy. The greenback will continue its long-term decline, dramatically losing even more purchasing power than it already has, and inflation will go through the roof! Meanwhile, Asian and other emerging economies continue to chug along just as they have been doing for the past six months. Do you think gold's bull market would end in such an environment? Do you think it would be bearish for gold? Hardly! The plunging dollar would cause investors to flock to gold even more than they already have been. The price of the yellow metal would soar even more than in the first scenario above, and would likely even exceed my most bullish target, rising well above $2,270 an ounce! Plus, in Either Scenario ... The Supply of Gold Is Plunging! Many analysts are claiming that in either of the above scenarios, gold's current price is high enough to bring oodles of new supply to the market, hence killing, or at least smothering the bull market for a while. Give me a break! These are the same analysts who have been claiming the price of oil was going to top out at $100 a barrel ... and that it's heading back to $50! Gold mine production hit an 11-year low of 2,447 metric tonnes in 2007. In 2007, the world's gold supply dropped 3% to 110.7 million ounces of the yellow metal. Gold mine production hit an 11-year low of 2,447 metric tonnes in 2007. Africa had the most precipitous drop of 29 metric tonnes while Latin America saw a 23 metric ton decline in output. South Africa, once the world's largest gold producer, is now producing its lowest amount in 86 years! And it's getting worse. In February alone, South Africa's gold production plummeted 28.2%. So let me set the record straight on the supply situation in gold: Do not, I repeat, do NOT expect any relief from new supplies of gold. The Long-Term Bull Market in Gold Is Alive and Well! Buy the Dips! I have absolutely no doubt whatsoever that gold will ultimately reach at least $2,270 an ounce, and perhaps even higher. So any time you hear that gold's bull market is over, I strongly suggest you ignore those sound bites, and instead, use virtually every price dip as an opportunity to buy. As I just showed you, gold is in a "win-win" situation — and it's the only investment I know of in today's markets where it's truly "heads you win, tails you also win." 1. Gold Bullion . 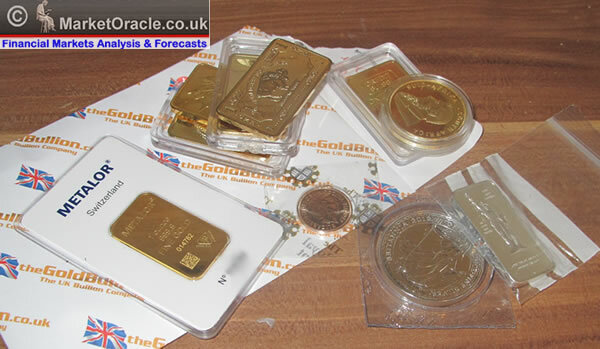 These are gold bullion coins such as the American Eagles and Canadian Maple leafs. But I prefer the one- and five-ounce gold ingots available at most reputable gold dealers. Store in your bank's safety deposit box, or at home in a safe that's securely bolted to the floor. 2. The streetTRACKS Gold ETF (GLD). This fund allows you to invest in an ETF that owns the physical gold for you, but without the storage hassles. If you don't own GLD, consider buying it now! 3. Gold stock mutual funds: Some of my favorites: Tocqueville Gold Fund (TGLDX) ... U.S. Global Investors World Precious Minerals Fund (UNWPX) ... and the U.S. Global Investors Gold and Precious Metals Shares (USERX). If you didn't purchase when I mentioned them in last week's Money and Markets , I strongly suggest you look to get in now. 4. Top-notch gold mining shares. Best suited for more accurate timing, see my Real Wealth Report for specific buy and sell recommendations. P.S. If you're not yet a Real Wealth Report subscriber, you can pick up an annual subscription — with 12 hard-hitting monthly issues ... all flash alerts ... special reports ... and 24/7 member's access to my website — for a mere $99. That's just 27 cents a day .